As far as I know, “Escape” mode never made it to TF2 in any fashion, so whenever I get the urge for it, I crank up Team Fortress Classic and play with its healthy repertoire of Escape maps available. Also (unlike the TFC proper servers in my area) it still has a healthy playerbase today, which I link to at the end of this article and anyone ho wants can go play with. 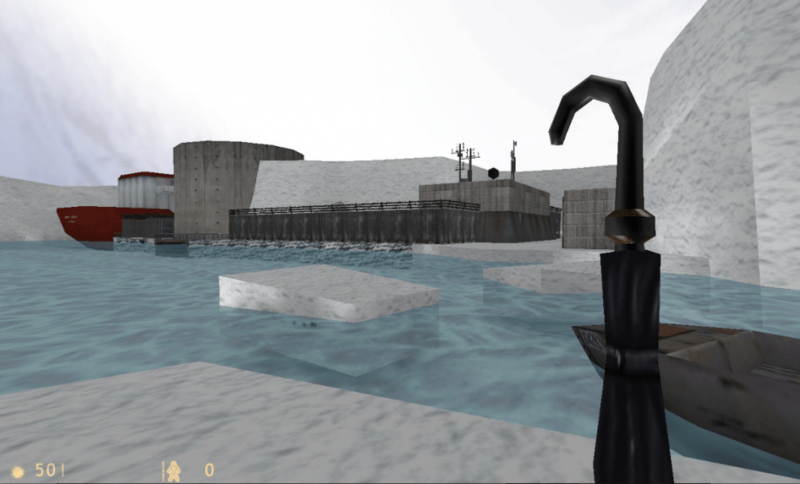 Unlike the rest of Team Fortress, all the popular Escape maps are incredibly story-driven; your team starts off by being given a scenario storyline to explain who they are, where they are now and why they are trying to escape the map. Perhaps they were crewmen of a ship that got sucked into another dimension and is now crash-landed on an alien planet. Or they’re a team of archaeologists attempting to navigate a jungle and find a rare artifact. 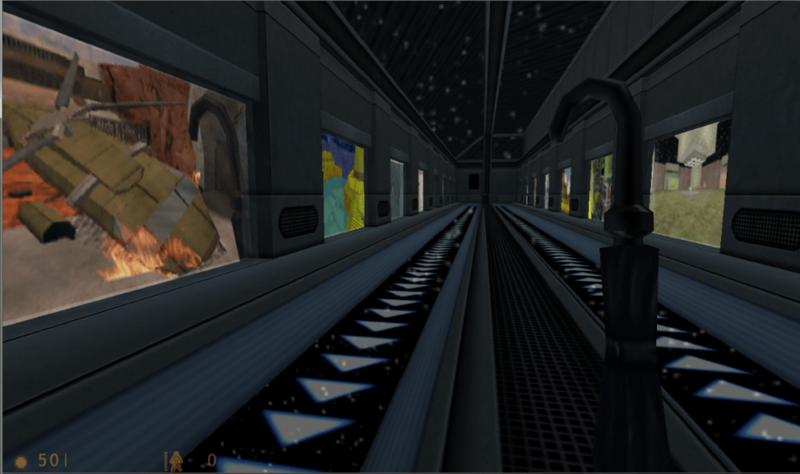 Escape maps emphasize jumping puzzles, cooperative timing, locks with hidden keys, and most of all forward movement. You will see every room in this abandoned arctic research station before you’ve escaped. Cooperation is critical in Escape, and most maps are designed so that numerous puzzles require a minimum of two players before it can be solved. Perhaps one player must push a button to open a trapdoor just as the second player, running from an approaching boulder, passes over it. Or the players must use each other as makeshift platforms to climb up walls and reach other areas. One of my personal favorites stranded the players in the middle of the ocean with medkits, and the team had to navigate a series of underwater tunnels while using the medkits on each other to keep from drowning. The makers of the best maps were deviously clever in coming up with creative ways to test the skill and ingenuity of those playing. Cityscapes, cruise ships, Arabian villages…the locales for Escape maps are as diverse as storytelling itself. This map is for players to select which Escape map they’d like to play next by popular vote. And don’t think just because you’re Civilians you won’t be using guns. I already mentioned medkits in one demonstrative puzzle; TFC classes are capable of wielding any TFC weapon without visual issue and guns can be placed in the map as pickups. Escape uses both of these features like any good adventure story does, so after you break into the guard shed of the prison and grab some shotguns, you know you’ll probably be fighting some NPCs soon. Half Life enemies are usable when the plot calls for it, and suddenly your puzzle game became a team-based survival shooter for a few rooms. I hope you’ve picked up by now that an Escape map can be as diverse as the creativity of who’s making it. My best piece of advice for anyone hoping to jump into Escape without having played it before; watch your fellow players. They’ve been doing Escape for years, and most of them probably have played this exact map dozens of times. If you aren’t sure how to solve a puzzle, watch and see what they are doing and attempt to emulate them. Another plus is that most puzzles need only be completed by a single person; once anybody retrieves the elevator key from the bottom of the shaft, he turns on the elevator and now anybody can use it to reach the next part of the map. 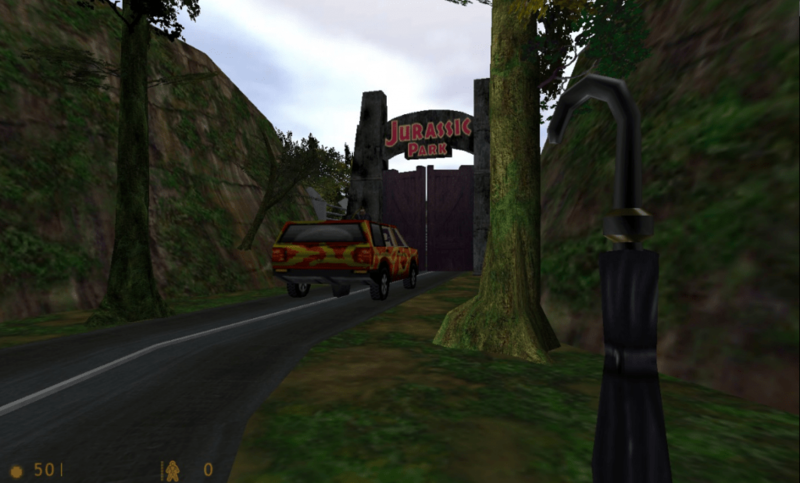 Some Escape maps recreate famous adventures from pop culture; this one lets you live through the events of the film Jurassic Park. Also, Escape maps assume you’ll have flashlight enabled. Hit default key ~ to open the console and type bind <key> “impulse 100” so you can use it. I use T (for “torch”) as my key, because F is taken by primary grenade. As I mentioned at the beginning, you can totally still go play Escape maps right now; several servers (usually marked FUN in some way) are still active and there are usually 5+ players online whenever I go jump in. To aid in recognizing your fellow players, they also have a plugin letting you pick from a variety of avatars to distinguish all the civilians from each other; I’m a pirate. These servers play a lot of custom game modes other than escape, but Escape is more often than not what’s on the menu these days. If anything I’ve said encourages you to try Escape mode out, I strongly urge you to give it a shot. If you don’t own TFC, maybe this’ll give you further reason to buy it. It’s only five dollars, and each Escape map is basically a game of its own, and those all come bundled for free. This reminds me of the JumpMaze game-mode in Skulltag: No weapons, no nothing. Just you (and the other Jumpers if applicable, then it’s a race! ), a series of platforming obstacles and the exit. Quite a lot of fun, actually. I have an old video about it. I have no idea how to code HTML, so I’ll just put the link below.